Most cooks want to learn how to make new apple dessert recipes in the fall of the year when all the apples are ripening in the orchards. Nothing says autumn more than the wonderful aroma of apple recipes baking in the oven whether it is fresh apple bread or a delicious cinnamon apple coffeecake. Through the history of apples we have been made familiar with the “all American” apple pie recipes but there are so many apple recipes beyond these. If you are learning how to make an apple dessert recipe, it can be as simple as learning how to make applesauce and eating it plain. From this applesauce many other recipes can be made like a delicious applesauce cake or applesauce bar cookies. 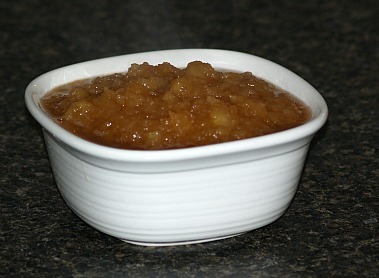 To make applesauce simply peel, core and slice four cups of apples; place them in medium size saucepan. Cover the apples with water and cook until tender. Drain the liquid off and mash the apples with a potato masher or put in food processor. Now you can season the apples with sugar (many apples do not need sugar because they are naturally sweet) and cinnamon if you like. From countries like England, Scotland, Canada and France cooks here in the United States have learned to make apple tarts which are much like our own pie recipes. Easy apple turnovers are one of my favorites and are made so easy by using a can of apple pie filling and frozen puff pastry. These are great not only as apple dessert recipes but serve well for breakfast or brunch as are apple pancakes or apple muffins. When learning how to make apple dessert recipes, it is hard to know where to start or finish because there are so many. Besides all the familiar more common recipes there are names of some which you may not have heard about. The apple clafouti recipe is a French country dessert made by topping the apples with a batter. This very delicious apple dessert is made with raisin bread and it is baked into a custard. It is similar to our apple bread pudding. 3 Medium apples peeled and cut into ¼ inch wedges. 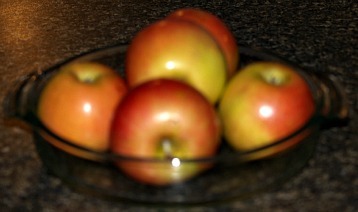 Cook apples in large skillet in butter until tender crisp. Preheat oven to 350F degrees; grease 2 quart casserole dish. Layer apples in casserole dish; top with bread cubes. Beat eggs until well blended in small bowl. Add flour, sugar, cinnamon, salt, vanilla and lemon peel; blend well. Pour in milk and beat well; pour mixture over bread cubes. Bake for 45 to 50 minutes or until inserted knife comes out clean. Apples have always been a staple here in the United States dating all the way back to the original New England colonies. The first settlers planned for future pioneers as they traveled by planting apple seeds everywhere they went. These were meant to help feed the thousands that were to follow them in the years to come. The fruit could be stored underground in root cellars or dried for use all winter long. 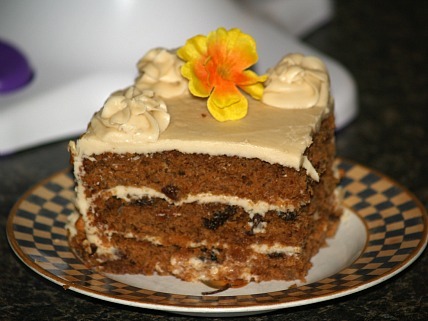 Nothing is more elegant than a recipe for apple cake in the fall of the year; this layered cake with penuche frosting recipe is a very delicious apple dessert recipe. It is great for a Halloween party or even Thanksgiving dinner. Cream butter gradually adding sugar; add eggs one at a time beating well after each. In another bowl sift together flour, soda, baking powder, salt, cocoa, cinnamon, cloves and nutmeg. Add dry ingredients alternately with applesauce to creamed mixture; begin and end with dry mixture. Stir in raisins and 1 cup of chopped nuts. Pour batter into 3 greased and floured 9 inch round or square cake pans. Bake for 25 to 30 minutes or until pick comes out clean. Cool 10 minutes and remove from pans; Cool completely on wire rack. 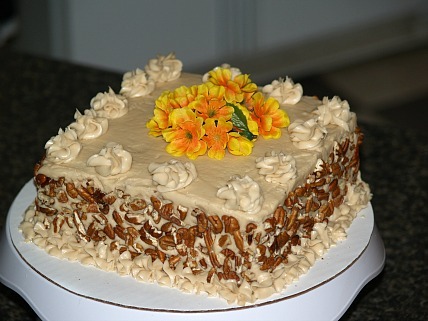 Spread penuche frosting recipe between layers and on top and sides of cake; sprinkle with ½ cup nuts. Combine butter, brown sugar, half and half and salt in heavy saucepan. Cook over medium heat until mixture comes to a boil stirring constantly. Boil 2 minutes and remove from heat; cool mixture. Stir in powdered sugar and frost cake. We all love good pudding recipes; this makes a great apple dessert recipe for Sunday dinner or any occasion. Combine all the dry ingredients; stir into creamed mixture. Add apples and stir in until blended; turn into a greased 9 X 13 inch cake baking pan. Bake about 45 minutes or until set; serve with vanilla ice cream or whipped cream.